I'm pretty sure I never blogged about this. I had every intention of doing so, but things got hectic and the photo was misplaced. My friend, Patt, gave me this when I went to visit her over Memorial Day 2015. I had no idea something like this existed. She had retired from her administrative position and was cleaning out cupboards. "Maybe you could use this?" she asked. I'm ashamed to admit I didn't know what it was until she explained it. It has saved my pocketbook and my work time. I found another one on a clearance shelf at Target. You see I have chicken noodle soup in this. But once I discovered Chef Boy-ar-dee still made Spaghetti O's, I started taking a can's worth in this one. So the one I got at Target is used for soup. You know, try as you might, tomato stains don't always come out of Tupperware after it's been microwaved. This has made lunches so much better. 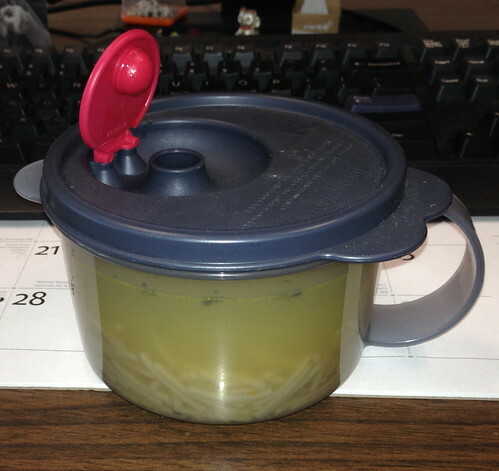 I dump a can of soup or Sketti O's into the container and take it to work. Add a bowl of Jell-O or sliced fruit or vegetables and I have a full meal. I don't absent-mindedly hop in the car and head to Wendy's or Subway; the two closest restaurants; for lunch. It saves me money and I can work through lunch. There are days when you just need to get out because you need the break, but my finances are much better for not going out a lot.